Welcome to our page about Almancil. For those interested in architecture and specifically churches there is a very special and interesting church here called,Igreja Matriz Sao Lourenco.If you like visiting churches this is one of the most beautifull in Portugal. Circa 18th century this outstanding example was built by the local townspeople in thanks to the Saint "Sao Lourenco" in thanks to a miracle when he supplied water in answer to their prayers.I believe Sao Lourenco to be a saint linked with Rome. The church alter is said to be a masterpiece in its intricately painted and guilded artwork.However the major interest are the blue and white painted tiles forming the stunning "Azulèjo" panels showing periods of interest during Sao Lourenco lifetime. from the saint's life. This Almancil area is more off the heavily beaten tourist track and some might say therefore,of little interest.If you like to see the indigenous side of a region then this is for you.The cafe life is formed mostly of local people and you can mingle amongst them.You will find the area seems a little greeener than many Algarve areas in the hot summer months.It may be to do with the huge resevoir on which watersports can now be practiced,including cheap pedal boats for your entertainment. 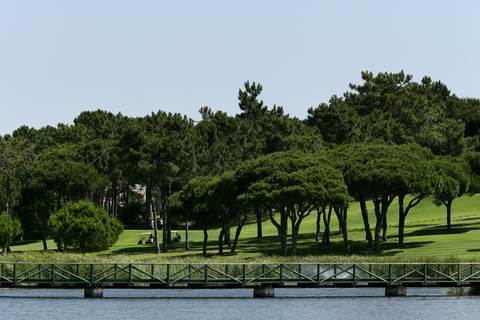 The golf courses are the main center of life around here but a good benefit is the Quinta do Lago shopping experience.Numerous good shops to be found. Rental Villas and apartments do tend to be rather expensive around the Quinta but nearer the town itself you might find some more affordable lodgings. The Quinta do Lago beach is all golden sand and is approached over a picturesque little bridge.Well worth visiting but get your own supplies before going over .You have been warned,it is exclusive and ultra expensive.For example a parasol costs a minimum of 22 euros for a day and you will not want to purchase water and icecream on the beach.Unless of course you are one of the super wealthy this has been designed to fleece!Sorry,I meant "cater for"
A Villa with a pool in the Almancil area. Just 15 minutes from Faro airport quite close to the vibrant town of Loule.The town has become important centre because of two prestigious and very famous developments for both residential living and holiday resort facilities.This has brought the town much needed tourist trade and as a result the place has become more prosperous and well known.Nowadays you will find a good selection of bars and restaurants offering many different types of cuisine. With the new commerce growing exponentially you will see many Estate Agents offices in the streets,vying for the attention of passers by.You can tell the prestige element of the developments has attracted wealthier people to the town.Where the rich live you will find interior decorators shops and offices and plush furnishings shops.This is exactly how the shopping areas look here. The names of these famous developments?One is the Vale do Lobo and the Quinta do Lago.These two seem to crop up in the psyche of all regular visitors to the Algarve as monied urbanisations everywhere always do. Locations of Interest for tourists in the Area. 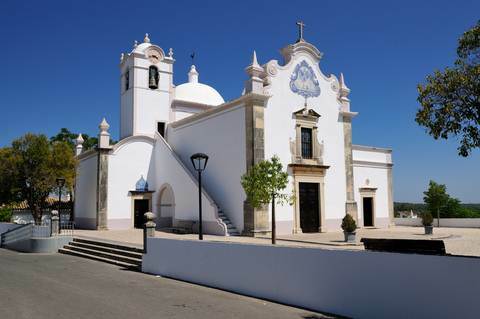 In a little village just outside the town is a beauttifull and noteworthy (take your camera)church calle Igreja de São Lourenço.Worth visiting because inside it is covered in 18th century ceramic tiles.Said to be an exemplary example of the art. Then we have the Centro Cultural de São Lourenço telephone no'	289 395 475. Many art exhibitions and musical events are regularly to be seen here.Along with other suitably cultural activities. All these beaches are within easy travel of Almancil and are of the standard well known throughout the Algarve and other parts of Portugal as well.You might have guessed that Praia is Portuguese for Beach.Most if not all hold the european blue flag for excellence. 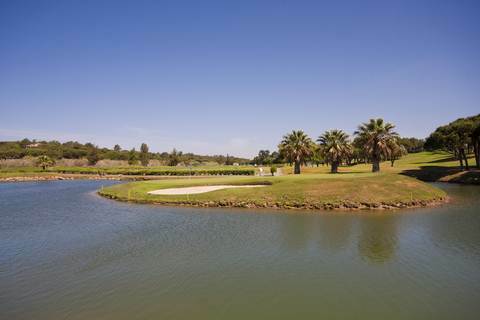 The above graphic is a typical view of the scenery you will find around the ALMANCIL area.This is one of the golf courses but there is so golf in this wealthy region it is just so reflective of this region of the Algarve. As one might expect the area is loaded with worldclass sporting facilities on the two resorts and round and about the town.Golf features heavily;no surprises there then. "Where there is money".The golf courses are very beautifull but of couse this has more to do with the natural beauty of the region.Tennis courts and clubs also abound here.So if you are into either of these you will be very happy here. Of course you do not have to stay in one of the affluen resorts as this type of holiday is not for everyone.There is a lot of rental property for those who want to be a little more private.Some magnificent villas with huge pools are available down to small studio apartments.So you will find something to suit you if you want to make use of all the marrvelous beaches and sporting activities. The two main Almancil resorts deserve a little bit of narrative so you can form an opinion of what they are like. Vale Do Lobo. Vale do Lobo i one of the wonders of the golfing world and considered one of the most difficult of courses in Europe.Everything about the whole place oozes class luxury and money.Translated into English we are told Vale do Lobo means Valley of the wolf. On the golf course the loud cries are just as likely to be gasps of scenery spotted for the first time,as for a golfing cry such as "fore". That is just the golf course,the beaches are just as much "to die for" and the general affluence abounds just as much on these sandy ocean side paradises.Keep tipping with those "twenties" or the staff's noses will turn skywards and you will see grops of them pointing in your direction and shaking heads. The accommodation is of the same high standard as the natural surroundings.The villas and hotels are of the highest order,so well kept and sparkling in the Algarve sunshine.These edifices speak of grandeur and sumptiousness (is there such a word,if not there should be and I just invented it. ).In these palaces one will find every luxury known to man and all pleasures can be ordered at the click of a thumb,decent pleasures I hasten to add. I am writing this whilst actually in Portugal so writing time is limited but I will return to the Vale do Lobo suject with some pictures for you real' soon. Almancil to Do you want to buy Photographs you have seen on this siteClick Here. This is one of the most photographed scenes in the area if not in the entire Algarve. It just typifies the pristine nature of the area.It is no mistake that this area became the preserve of the rich and famous.Heads of state and the rich and famous can often be spotted in this area,binocs' will be needed and long range lenses etc. One of the best known activities is the Pinetrees Riding stables,where one can ride through unspoilt countryside of pine tree forests.Seeing nature at its finest. From their own website"Undoubtedly one of the main reasons for choosing this location was the excellent terrain for horse riding; an abundance of sandy tracks and open land, wild flowers and herbs, and not far from the golden sandy beach and nature reserve."